It was a lovely Thursday five weeks ago and we were just wandering around the center of Helsinki with my friend Kulkuritar. I was still on my sick leave so no school and we were just two happy goofies who had nothing to do, but that's just perfect. 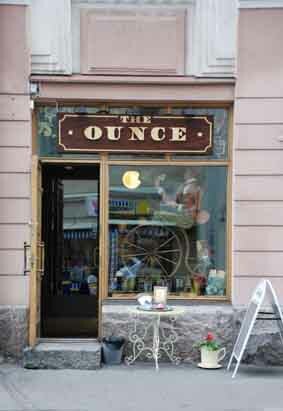 We were kind of "half searching" for this place called the Ounce, a tea boutique my friend's sister had recommended and we found it! 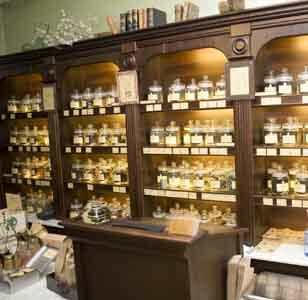 Inside the Ounce, lovely tea shelfs ♥ Picture from same place as above. Tea room was small but in no way uncomfortable! Really charming. We decided to sit in one corner table where there was a sofa too, not in the picture. Picture credits to my friend Kulkuritar. We had this tea called Kolme veneessä (free translation would be Three in a boat), it's black spiced tea. Kolme Veneessä is a mixture of black Ceylon and Chinese Keemun tea. To add the flavor there are bits of mango, raspberry, redcurrant, blackcurrant and knapweed. We both had this tea in our own pots (very nice indeed) and it was so good and so cheap when compared to quality. Many of the delicious tea are only something like two euros par ounce. Like my friend said, it's so much better than buying some bag tea with 1.5 euros in an ordinary café, here you can get braised tea with quality. And of course, we bought something to go too. My friend bought Creme Bruleé (Indian black tea with toffee bits) and Wu Lu Mountain (Chinese green tea) and I bought two ounces of tea and also something else cute! I'll tell about them in the next post so keep following, mwahahahaaa! Just before Easter I went back to the Ounce and bought that Creme Bruleé because damn, it just smells too good! And then I bought Pääsiäiskakku (Easter cake) tea too. Creme Bruleé was even better than its reputation, so sweet, with milk it was like having a dessert ♥ and the Pääsiäiskakku was very, very nice too!